We had a good group up at Jordanelle this morning: Goody, Lisa, Chris, Liz, Adam and myself. This was Chris's second time swimming with us and Adam's first. After chatting at the boat ramp for a while, we jumped in and started swimming. The water was really nice and clear. My thermometer read 71 degrees. On the first lap, we stopped at the end of the buoys to wait for everyone to catch up before heading back the other way. 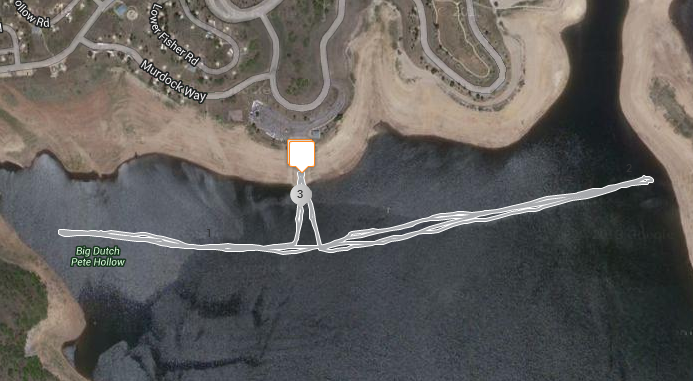 Chris took off when we got back to the boat ramp and everyone else continued on to the opposite end of the buoy line. We stopped again to regroup before heading back to the ramp. It was a little bit bumpy on the way back to the ramp, but not too bad. After a quick drink, Goody, Lisa and I headed out for another lap. This time I wanted to push it a little harder and not stop to chat and let people catch up. I really like swimming with Lisa. She doesn't let me slack off and is right there with me (or ahead of me) the whole time. It's nice to swim with someone so close to your same speed. I really love swimming at Jordanelle in the morning. I'm excited to go back up again later this week, probably Thursday morning.